Garage door springs are the parts of your system that are in charge of supporting the weight of the panels and providing the door with the necessary tension to allow it to move. When they break, they can be extremely dangerous and will require the assistance of a professional technician. While all springs do have a finite lifespan, there are ways to increase their longevity and delay their inevitable end. Making sure your springs are properly cared for can ensure that they will be able to last for as long as possible. Our company offers regular maintenance services, during which we perform a close examination of these important components and replace them if their condition proves to be bad. We also adjust their tension and provide them with the proper lubrication, which helps them operate more smoothly, and reduces their wear and tear damage. When a spring breaks, you're more than likely hear a loud BANG coming from inside your garage. That's the sound of its stored tension getting released. It is very dangerous to try to use your door under that condition, and you must call our experts right away. Replacing a broken spring requires special tools and a lot of skill and experience, as any mishandling of this component can lead to serious injuries. Our company specializes s in providing local homeowners both torsion and extension spring repair services. These are the two main types of these components, each of which operates differently to achieve a similar goal. Extension springs are the older type. They stretch and contract in order to support the weight of the door, which makes them more likely to break, as they are more susceptible to wear and tear. Torsion springs operate differently. They twist and unwind, which makes them much more durable and strong. They are therefore considered the safer option of the two. 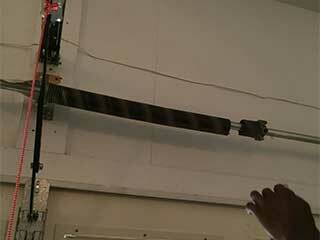 Whether you need torsion spring adjustment and lubrication, or to have a broken extension one replaced, you can count on our experts at Garage Door Repair Encino to perform the necessary work quickly and efficiently, and - most importantly - safely. Contact us today.